I commented the other day on the beautiful Learning Parade blog, that a visit there always gives my art heart a lift. And so it does, but it started me pondering those two words. Like many people, I can't draw for nuts, yet it has always been something I wished I could do. Is that what makes me especially appreciate lovely visuals when I see them? I love to browse in art galleries, cartoon books, graphic design blogs and children's illustrator websites. And I know I'm obsessed with technology and image creation. Somehow, I suspect that's because I hope one day someone will invent an application that lets me create drawings I can be proud of. I think it's also because I love to play. Yes, I know I dress it up by calling it creativity, but at core, I am playing with colour, pattern, shapes and lines. I fiddle a little here, tweak a tad there, and satisfy my instinct to make art. Even when that art is scribbled yellow stick figures on a blue background. Inside my head, a happy voice is asking, "What will happen if I change that bit?" and "Does that colour please me against the blue?" My adult head recognizes that my scribbles are nothing like what artists produce, but my childish heart ignores that and has fun anyway. What was the artist trying to achieve? How did they create this picture? Does it tell a story/have a message? How will I react to this artwork? This last question might elicit a response that leads me to create something of my own - more play! Perhaps even those of us without training can encourage an appreciation of art in our kids, and support their natural curiosity and desire to experiment. I suggest we could do this by practical means - setting aside a place where mess is okay, assembling different materials for art play - and philosophically - sharing our own interest in artistic endeavours and asking our kids questions that encourage creative thinking. I think we need to make sure kids experience a wide range of media, while emphasizing the "it's okay to play and have fun" message. My friend Jeanne at A Peaceful Day has some wonderful, practical ideas for getting the most out of a trip to the art gallery with a child. Our aim she says, should be to "... share the joy of art with your children." If it's getting started with art making you need tips on, Art Junction has ideas that might spark art in your family. How about you? I'd love to read your ideas. 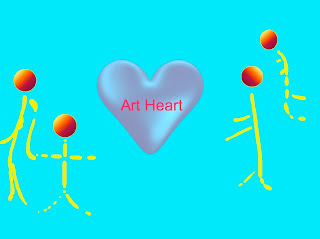 Do you have an art heart too? What do you do to nurture it? 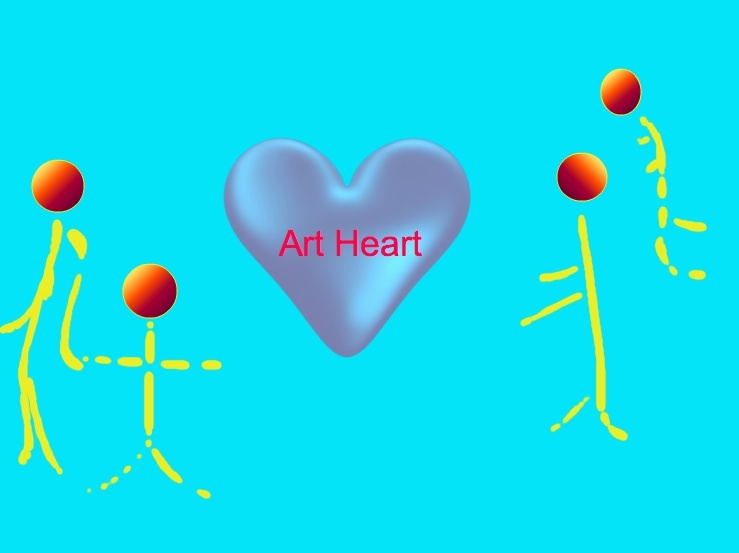 How can we nurture art hearts in our kids? And is that important? Appreciating art as an adult is something completely different than educating art. Although showing your art-appreciation helps a child to 'get wild' about art too, enhancing creativity and art-making in children is about coming down to their level and enjoying their creativity. That is much more difficult than developing your own art-appreciation. Kids have such a flexible minds and endless fantasy. For them there is hardly any distinction between nature, art, mess and play. Adults make these categories, children have elastic minds and can see 'art' in so much more than adults can. My daughter learned a lot of my art-class, I learned a lot of her free expression. Now we both have our own 'Gallery' on my website. We love to draw and paint. What is important? I would say nice music (on the background), good materials, good teaching of techniques and very little or no criticism at all in the younger years and role modeling (if a parent makes music, so will a child, same for art, seeing is doing). I absolutely have a heart for art! I love everything about it. Like you, I long to be good at it. I think I have an eye for design and color but I can't seem to get that to translate to creating (at least not in the form of drawing or painting). I am so drawn to art that I married a graphic artist. I love seeing the world through his eyes. My name is Kelly. I have an Art Heart. ;) Love this post. I too, have no training in art but have deep love and appreciation for the expression and talent of others. I always think if I could go back, I may study some form of art. But you know BC, writing is art too. Paula, I'm so glad you put the "Be Creative" link, and wish I had thought of it when writing this post. Thanks, too, for your points made. Being a role model in art, music, good manners, literacy - our kids copy our attitudes and often our enthusiasms, so it is important to share them. The only one I am not sure about is 'good teaching of techniques'. What if parents are like me and have no techniques? Isn't it possible to work alongside kids as two beginners learning and exploring and teaching ourselves? Kelly, T, I hereby confer on you the inaugural Book Chook Art Heart Award! Being able to use an artist's eyes that way must be wonderful! Kelly B, you are absolutely right. I forget sometimes that writing is my creative outlet and I am lucky to have it. Problem is, I want to be an artist, a musician, a choreographer, a dancer, a photographer, a movie maker - I want it ALL! Not sure I have an Art Heart. Like you would love to be able to draw, and I still enjoy playing at it. My son has developed a growing love of drawing and creating things. We currently have his easel in the living room, and even when watching television he will stand at it and draw something inspired by what he is watching. He forever has felt tip pen all over his hands, and is like a Nazi if you leave a top of one of his beloved pens. Art heart for sure and you've passed it on to your son! He already understands about looking after his tools. That is decadence on a stick! But I love the chooky theme! This is a test to see if the comment goes through. You might check to see if I've joined your site more than once. The comment provider kept having me 'sign up' for your site about three times. I love art and anything art related! It brings out the creativity in me. My children and grandchildren also have a love for art and are gifted. I make sure to pass on what I know to them when they ask. Art connects on such a deep level. It flows and crashes, entertains and can sadden. Children are so expressive in art when we let them be. Their art reveals thoughts and feelings that the child may not be able to articulate, but you'll see it if you really 'look' inside their artwork. Donna, your art heart is obvious in those beautiful words! I love your point about art revealing more than words can - I think that's true with adults sometimes too. Thanks for commenting, and special thanks for persevering when the comment system seemed to be fighting you! So glad you enjoy our artwork and creativity! I think my favourite art times are when we are inspired by the work of famous artists. Not necessarily to copy their techniques, but just to be inspired by the content - you must check out the Take One Picture project that runs in Britain!